Taradevi Biography singer Tara Devi Biography in Nepali Tara Devi singer was born on 1945 in Kathmandu, to Krishna Bahadur and Radha Devi. Tara Devi started singing at age seven and went on to record 4000 songs in her singing career of 40 years. When she was 5 years old, she went to Radio Nepal and got the opportunity to sing. Her singing was so soulful that everyone in the crowd got extremely impressed. She was primarily involved in singing for children's programs at Radio Nepal. She was able to pursue her musical career along with her studies. She completed her Bachelors in Music. During the starting of her career, She would earn Rs. 5 per song at Radio Nepal, which eventually rose nearly to Rs 110 ( USD 1 as of now ). She was very content her singing career and was appointed as a Kharidar at Radio Nepal and was later promoted on to be Secretary during her 30 year long commitment to Radio Nepal. Tara Devi is famously termed as the "Nightingale of Nepal". 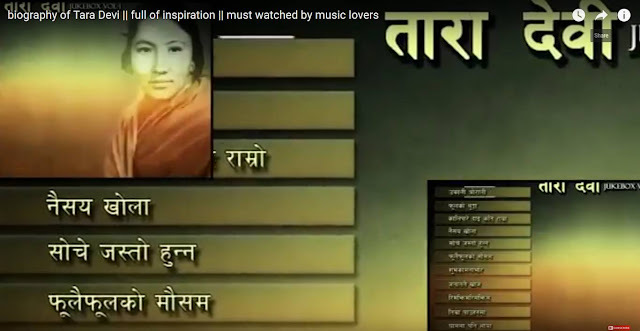 Tara Devi has recorded songs of wide range of genre from prayer songs to Nepali folk songs, most of which are regarded as classic numbers in Nepal. Almost every lady singer in Nepal is heavily influenced by Tara Devi in one way or another. Some of her famous numbers are; 'Ukali Orali Haru ma', 'Pool ko Thunga', 'Kali Paari Dai kati ramro', 'Nirdosh Mero Pachhyaurima', 'A Kancha' and 'Himal ko Kaakhama'. She got married with Shiva Bahadur Shrestha, an aircraft pilot by profession in 1966. Later in her life, Tara Devi endured difficult periods after she lost her 25-year-old son by blood cancer. Soon after, her husband died in an airplane crash. She was unable to recover from this tragedy and her health started deploring. She became physically unfit and later was diagnosed with Parkinson's disease which put a halt to her singing career. On January 21, 2006, she died a peaceful death at the age of 60. She is survived by a son and a daughter.